Chicago started life with a split personality. By the end of the Civil War wealthy Chicagoans and their wives were struggling to prove that their city was as affluent and civilized as its East Coast counterparts, New York, Philadelphia and Boston. Mansions rose, an art museum was founded, and music halls lured opera stars. Yet, all the while, stockyards, rowdy cowboys and slaughterhouses continued to brand Chicago as a western outpost. When the great fire of 1871 destroyed much of the city, Chicago emerged determined to take its place as a leading metropolis. The World’s Columbian Exposition of 1893 changed American architecture and put Chicago on the international map. This trend continued in the twentieth century with architects like Louis B. Sullivan and Frank Lloyd Wright, and Chicago-based architectural movements such as the Prairie School and the Chicago Style. But impressive and important as Chicago’s architectural and sculptural landmarks are, there is more to them than design and style. Seeking Chicago explores the human stories of the city’s buildings. In these pages you will find a priest who dodged gangland bullets in the garden of his church; a socialite who complained to a judge that Prohibition had raised her husband’s excessive drinking to intolerable levels; a millionaire whose search for privacy resulted in a mansion with its windowless back to the street; and much, much more. 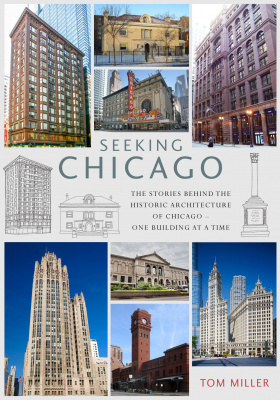 Intriguing and informative, Seeking Chicago is a must-read for those interested in Chicago and how it got that way. Tom Miller was born in Dayton, Ohio and has lived in New York since 1979. He recently retired from the NYPD's Auxiliary Police. He has long been fascinated by the social histories − the personal stories − behind the bricks and mortar, the marble and bronze. In his popular blog Daytonian in Manhattan and his 2015 book Seeking New York he told the little-known stories of some of Manhattan’s buildings and monuments − the scandals, the pathos, the joys and the tragedies of the people behind the structures. Now he applies his forensic skills to the buildings and people of Chicago.